There is a significant difference between a job and a career, says Deputy Vice-Chancellor Research and Internationalisation at the University of Cape Town, Professor Mamokgethi Phakeng. 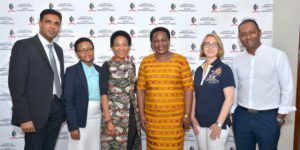 Speaking during Imbokodo – the Women in Leadership Programme on UKZN’s Westville Campus – Phakeng emphasised a career was bigger than a job. It was not tied to a performance agreement or working hours with the incumbent deciding what he or she wanted to be. In her presentation: Developing a Successful Career in the Midst of Opposition and Patriarchy, she explained that a career was what a person did for themselves. A 51-year-old mother of five, Phakeng said an academic career comprised research, community engagement, and teaching and learning. Research went hand-in-hand with teaching and was an essential part of being an academic. Phakeng acknowledged the many challenges women faced including family demands, criticism, patriarchy, unfairness, jealousy, envy, societal expectations and smear campaigns. She said people needed to be specific about where they want to be and to set their career goals based on critical national and international benchmarks which should not be based on the standards of an institution. Examples of benchmarks included obtaining a PhD and publishing in high quality journals. Dean and Head of the School of Engineering Professor Cristina Trois thanked Phakeng for her presentation, saying Imbokodo sessions were part of initiatives to create a leadership academy.